I want to ensure that I can upgrade my Mac to the latest macOS Sierra without losing any app or file. Any OSX backup software that runs on macOS Sierra can help backup all my movies, photos, data and apps? Backing up Mac regularly can be helpful when you want to update Mac to new macOS Sierra without losing data if the installation goes wrong or when other accidents happen to your computer. To keep the data safe, many users would like to hold a copy of the document, movies, photos, files on their Mac. Good Mac backup software can easily backup Mac files to external hard drive or portable devices or other accessible places. Therefore we share a list of best backup software for Mac (MacBook Pro/Air, iMac etc), including Mac DVD backup software, data recovery software, remote-access software, and online backup software Mac users can rely on to make sure everything is safely stored. All-around Mac Backup Software to Backup iMac/MacBook Air/Pro etc. Mac backup becomes simple and fast with the help of MacX MediaTrans, a feature-rich file backup software for Mac with data transfer, backup and management combined into one. It can turn iPhone iPad etc. mobile devices to external hard disk drive to save and backup all your Mac data, including movies, music, videos, photos, apps, dmg, documents files folders etc, and restores the backup files to Mac within a few clicks. Step 1:Free download the Mac backup software and launch it on Mac. Connect your iPhone or iPad to Mac via a USB cable. Step 2: Click "Flash Drive" icon on the main interface of the Mac backup tool and mount iPhone as hard disk drive on Mac for later Mac backup. Step 3: Click "Add" button and select file or folder to put into your iPhone iPad. The mounted iPhone iPad external hard drive can store any files backed up from Mac with this iTunes alternative mac:PDF, PPT, RAR, music files, movies, TV shows, videos, photos, documents, etc. And all these can be done in a fast speed without waiting. The first best Mac backup software we share is specially designed to backup DVD movies on Mac to external hard drive, iPhone, iPad, Windows, Android mobiles or digital formats. MacX DVD Ripper Pro, a special DVD backup software for Mac, is able to backup any DVD disc, ISO image, DVD folder on Mac (MacBook Air/Pro, iMac etc) in 1:1 quality to MP4, MKV, H.264, MOV, M4V, QT, AVI etc for safe storage in external hard drive, or 2018 iPhone (Xs/Max/XR), new iPad Pro 9.7/12.9, Samsung Galaxy, etc. This Mac DVD backup software is recommended also for its powerful ability to handle various copy protections like DVD CSS, region code, RCE, Sony ArccOS, UOPs, Disney X-project protection etc. TimeMachine is a built-in Mac OS X backup software since OS X 10.5 Leopard and stands as the simplest way to backup Mac files, apps and the operating system. This method can make a full copy of Mac and its data on El Capitan 10.11.4, Yosemite etc easily. It's easy to use and allows automatic on-the-hour backups using the spare disk space. But the main problems using this backup software for Mac is that it can't create bootable duplicates, leading the restore process to take many hours and even days during which time you can't use your Mac. 2. Click the Time Machine button. 3. Turn on the Time Machine slider slider. 5. Time Machine will format the hard drive for backups and start the backup within two minutes. * Can't create bootable clones. * Back up MacBook Air/Pro, iMac etc to CDs or DVDs. * The backup software Mac offers no encryption. 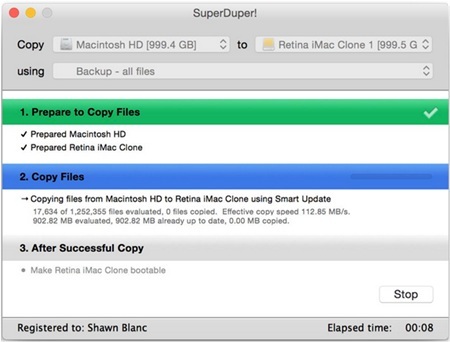 SuperDuper is also among the best Mac backup software for those who want to backup MacBook etc without Time Machine or want to create bootable clones. With this Apple Mac OS X backup software allows users to choose what to copy and where to copy it. Besides the main highlight of creating bootable copies, it also features clear explanations for new users on how to back up Mac data and files. The latest version of Mac OSX backup software works with El Capitan. The app is free to try, and the full version is priced at $27.95. 1. Prepare the backup drive: open Disk Utitlity > select the external hard drive in Other folder in Applications > click Partition tab > select 1 Partition > Give the drive a descriptive name and select Mac OS Extended (Journaled) from the Formatd > Click Apply and wait for a few moments for SuperDuper! 2. Copy Mac with SuperDuper: open the backup software for Mac SuperDuper > Select the target hard drive in the pop-up menu > cick the Copy Now button > enter the administrator password and it will backup Mac files to external hard drive or other new hard drive. 1. No support for cloud storage of MacBook Air/Pro/iMac backup files. 2. The Mac backup time with this macOS backup software may be long. 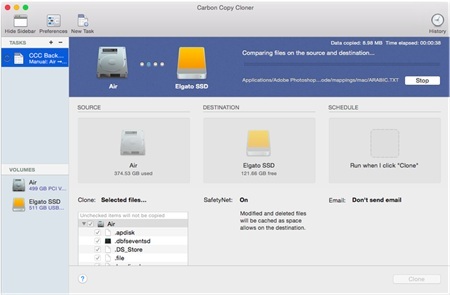 Carbon Copy Cloner is also a welcome Mac backup software to create bootable clones. This backup program for macOS is easy to use and can do the job quickly. All the data and operating system's data will be stored on a bootable volume, so that users can easily boot from the backup and restore the Mac. Compared with SuperDuper, Carbon Copy Cloner has an advantage of incremental backups and cloning of recovery partition. But it's more expensive at $40. 1. Open Carbon Copy Cloner app. 2. Click on the Source pop-up menu and select your Mac's boot volume. 3. Select clone drive from the Destination menu. 4. Click the Clone button. 5. You can set up a recovery partition on the target drive with Carbon Copy Cloner. 1. Version 4 only supports OS X 10.8 and later. 2. Cannot reorder tasks in sidebar. 3. No folders in sidebar make it hard to organize large sets of tasks. 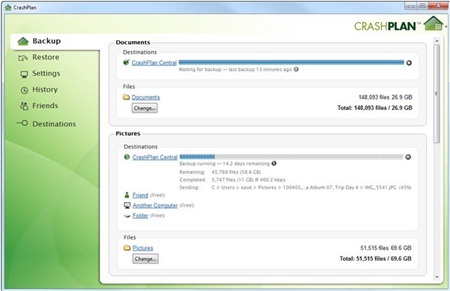 CrashPlan is an online backup application for Mac, Windows and Linux. Unlike the three Mac os x backup software above mentioned, it can backup MacBook Air, Pro, iMac etc to the cloud. It supports backup Macs up to 10 computers at home, delivering multi-destination protection. As a cloud backup service for Macs, you not only have access to your files on other computers but also on mobile devices. 1. Install the CrashPlan app on the Mac. 2. Enter your name, email and password to create an account to sign in. 3. Select the file to backup, or CrashPlan will select user folder for initial backup by default: Click Change to adjust the folders selected for backup > Click Start Backup and it will start to backup MacBook Air/Pro/iMac etc to cloud. 3. No option for file sharing or device syncing. Verdict: The above Mac backup software offers comprehensive Mac backup solution from Time Machine to boot clone and cloud backup. 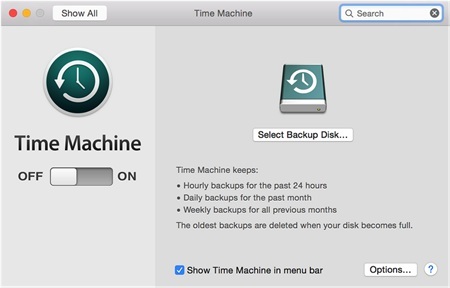 In fact, you can choose one backup software for Mac as a supplement Time Mahince, like Mac DVD backup software, Time Machine and an boot backup, or Time Machine and a cloud service backup. However, if you want to backup MacBook Air/Pro/iMac without Time Machine, the Apple Mac OS X backup software alone can also cover your needs.